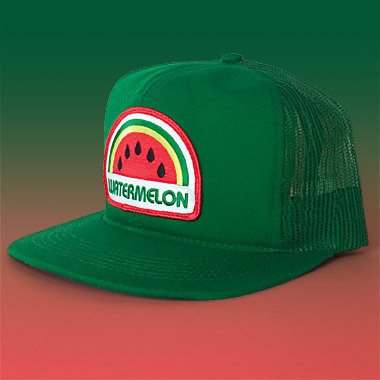 WE LOVE WATERMELON AND MADE A HAT: The new DDC “Watermelon” action cap! The patch came first, then the hat. Scroll down a bit to the product description for the WHOLE story. Watermelon, forever! MAN, WE LOVE WATERMELON: We’ll say it again. We love watermelon. A whole bunch. So we made a patch to celebrate our favorite melon. I don’t know what else to say? 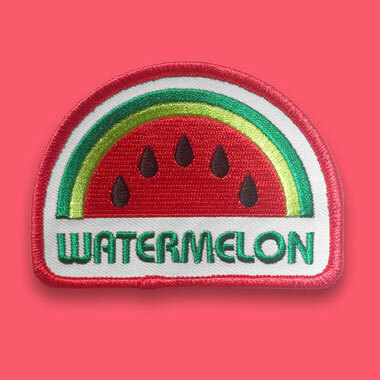 One day I’m just laying there on the couch DEVOURING chunks of delicious watermelon, and thinking to myself, “Damn, I love watermelon.” Inspired, I design up a patch and send it off. A couple weeks later, the finished patch shows up. And I hold it in my hand, marveling at the world I live in. Delicious watermelon. From the earth. And now a little patch celebrating just that. Things can be like this. They are like this. The new DDC “Watermelon” patch!